In September The Westlake Orchestra (Westlake Girls' and Boys' Schools in Auckland) recorded two of Anthony's works for amateur orchestras: Balkan Bagpipes (1985) and Procession (2008). Conducted by David Squire, these recordings were also filmed and will be available on the SOUNZ website soon. Cornet Rhapsody was premiered no less than twelve times on the same day, at The National Brass Band Championships in May. It was commissioned by the Brass Band Association of NZ (BBANZ) as the test piece for solo cornets. It references a Hungarian folk tune and shows off the soloist to a high degree. Dunedin's John Lewis was the winner on the night, with his performance being live streamed from the event. The sheet music for Cornet Rhapsody is available from BBANZ for purchase, or from the composer. Following the performance of Gallipoli to the Somme Anthony has been recognized for his contribution to choral music in the community by being appointed Patron of City Choir Dunedin. He is already patron of the Southern Youth Choir. City Choir Dunedin will be performing his Lullabies on September 2nd, in Knox Church Dunedin. The album Expressions: Piano Music of Anthony Ritchie, performed by Tom McGrath, has been released on Bandcamp. Download individual tracks or the whole album. Music for Tristan, for piano, has also been made available on Bandcamp, as a separate track. Anthony's Wind Quintet (2009) has been released on CD, entitled Zephyr: Music for Winds, Atoll CD, ACD 716. The work was commissioned by the group Zephyr who include New Zealand Symphony Orchestra players. It is available through Marbecks in Auckland or Atoll Records. Anthony has been enjoying some dedicated time composing as he takes Research Leave leave from the University of Otago this semester. He has been working on various projects, including new works for NZTrio, for Cellos Aotearoa (entitled Memories of Purakaunui for 5 cellos and piano, performed October 3 on the Arts Festival Dunedin), for tenor and piano (for James Rodgers), and for cornet (a solo test piece for Brass Bands NZ). However, his major project is a new symphony – No.5. Anthony is exploring a new approach to composition in this work, based on simplicity and naivety. Gallipoli to the Somme was broadcast on RNZ Concert on the evening of November 11 - Armistice Day. Follow this link to hear it on replay radio. Anthony originally arranged the song for Rangi Ruru High School in Christchurch. It has spread world-wide (and has now been imitated by other arrangers!). All versions cost $30 which includes the right to perform as often as you like. They can be provided as PDF files or as hard copy scores. Or you may like to request a new version of Tutira Mai. Contact Anthony. Whispers of Gallipoli is Anthony Ritchie's response to baritone Robert Tucker's commission of a new work about the tragedy of Gallipoli on this the event's 100th anniversary. Anthony has used the words of soldiers, anxious mothers, poets looking back on the campaign and a range of other sources to build a powerful picture of events both at and surrounding Gallipoli. Whispers of Gallipoli has also been recorded for a SOUNZ film, and will be available on the SOUNZ website. "Ritchie's score brilliantly evokes the sound of New Zealand. The music is spellbinding... This is New Zealand history as we have never seen it before, and is a brilliant addition to this country's opera tradition. Highly recommended." It is based on the dramatic story of missionary Thomas Kendall and his dealings with Nga Puhi chief, Hongi Hika in the early days of New Zealand settlement (1814-1820). The libretto by Michelanne Forster tells a story of love, ambition, idealism and harsh reality, based on historical fact. It includes the famous visit by Hongi and Kendall to King George IV, and the subsequent musket wars. The story is related through the eyes of Kendall's long-suffering wife, Jane. The cast of This Other Eden includes brilliant young performers Elizabeth Mandeno (Jane Kanedall), James Rodgers (Thomas Kendall), Joel Amosa (Hongi Hika), James Adams (Samuel Marsden), Matt Landreth (the convict Stockwell), Tamara Mayo (Tungaroa) and Clinton Fung (Waikato). The film was made at the dress rehearsal and is divided into 4 segments that you can watch here. Anthony's overture 'A Bugle Will Do' (1996) was performed in August by The Ulster Orchestra under Nicholas Braithwaite, and broadcast on BBC3 recently. If you would like to hear the broadcast go to the following link. Anthony's overture is first on the programme. Atoll Records has just released Fjarren: In the Distance featuring clarinet quintets by Anthony and fellow New Zealand composer Ross Harris. Their works are superbly played by the Swedish group The Dalecarlia Quintet, with Kiwi Anna McGregor on clarinet. Anthony's Clarinet Quintet dates from 2006 and was commissioned by Christopher Marshall for Gretchen La Roche and The New Zealand String Quartet to perform. It's an epic work that explores lots of emotions from joy to despair. It also commemorates the 250th anniversary of Mozart's birth by referencing that composer's own clarinet quintet. Ross Harris' mysterious and veiled Fjarren makes an excellent foil for Anthony's piece, and also references the past, this time a theme of Brahms'. The CD is rounded out by Anthony's short piece Purakaunui written especially for the Dalecarlia Quintet, and toured by them as part of a Chamber Music NZ series in 2013. In September 2014 John Ritchie, Anthony's father, died at the age of 93. His career as a musician and composer touched many people's lives. He is best known for Kiwi classics such as the Clarinet Concertino or Papanui Road Overture. 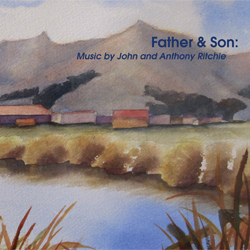 On this new album, Father & Son: Music by John and Anthony Ritchie, for the first time John's ground-breaking song cycle Four Zhivago Songs (1977) are recorded onto CD by soprano Rebecca Ryan, with John van Buskirk at piano. These settings of Pasternak's poems are moving, whimsical, lyrical, modernist... and many other things. John's final composition, his Clarinet Sonata, also features on the album. This sonata was completed by Anthony during the last years of John's life, when his eyesight prevented him from working on composition. Performed by Stephen Cranefield, with pianist Tom McGrath, this sonata is characteristic John Ritchie, finishing with a cheeky and virtuosic finale. The other half of the CD features pieces by Anthony that all involve the violinistic skills of the wonderful Tessa Petersen, including Variations for G.B.P. for violin and organ (David Burchell, organ), Four Violin Duos (with Justine Cormack, violin) and Thoughts from an Inner Garden (with Rebecca Ryan and John van Buskisk). The last item is a cycle of seven songs, setting poems by the late Diana Neutze, who suffered for over 20 years from multiple sclerosis. These are moving songs, reflecting on life and death, and Nature. Anthony has recently been chosen as Composer-in-Residence for a 3-week stint at the seaside town of Visby in Sweden, in October-November 2016. The Visby International Centre for Composers offers the use of well-equipped studios and the stimulating company of other creators. Anthony will be working on a project that collaborates with Swedish-based clarinettist Anna MacGregor and violinist, Manu Berklejon. He is aiming to make this part of his sabbatical leave from Otago University in 2016. MusicWeb International editor Nick Barnard has selected Anthony's 'Stations' as one of his Recordings of the Year for 2015. Read the full selection here. Anthony's 1995 work Whakatipua for string quartet has been chosen for The inaugural Aroha String Quartet recordings later this year. The Aroha String Quartet features Haihong Liu, Simeon Broom, Zhongxian Jin and Robert Ibell, and has developed an impressive track record over a decade. They are collaborating with SOUNZ on the recordings, which will be made available on the SOUNZ website in 2016. Whakatipua was written for the 60th birthday of Pat Jones, and has also been performed in version for string orchestra; this will be its first recording. "In many respects it's comparable with Britten's War Requiem, though not on the same level. After some very intense sections, often as sorrowful as Gorecki's symphony of that name, the work ends with celebratory music leading to stillness and quiet..."
"The value lies in the quality of the music and the performance, and both are very much worth your attention. If you're not sure, sample the music from Qobuz - subscribers can stream the whole work: don't make an instant judgment based on one hearing - but you won't find the booklet there. For that you need the CD, which can be obtained at an attractive price by clicking the MusicWeb-International purchase button." Father and son composer-combinations are relatively rare in recent times, but there have been some famous examples: Johann Sebastian Bach and his sons, Carl Philipp Emanuel and Johann Christian, Johann Strauss I and II, Wolfgang Amadeus and his father Leopold Mozart, Domenico Scarlatti and his father Alessandro. Anthony was fortunate to have been exposed to numerous musical sources of inspiration when he was growing up with his family, and not just his father: his mother was a fine soprano who sang solos on many occasions, and his brothers and sisters all played and listened assiduously to music. Records of Beethoven, Shostakovich and Bartok jostled alongside the Beatles, Fiddler of the Roof and Dark Side of the Moon. Anthony and his older brother Simon used to refer to the 1960s Kiwi Pacific Record of John Ritchie's Clarinet Concertino as simply "Dad's music". It was just one of many LPs in the house. However, in his teens Anthony became interested in writing down his piano improvisations, stealing quite a quantity of his father's manuscript paper in the process. Over the years, John quietly encouraged his son without ever pushing him into a career as a composer. He let him go his own way, while fostering Anthony's interest in East European composers, Bartok, Stravinsky and Shostakovich. There were never formal lessons, but a lot of sharing of information and opinions about music, and birthday presents that consisted of music scores. This album also represents an investigation into the violin, and its multi- faceted character. The Variations for G.B.P. and Thoughts from an Inner Garden were written around the same time as Anthony was working on a Violin Concerto. He feels very privileged to have been able to work closely with Tessa Petersen, and the other musicians, on this recording. Anthony was pleased to hear that his overture A Bugle Will Do is being performed by the Ulster Symphony Orchestra in Ireland under conductor Nicholas Braithwaite, on August 21. It will be part of a BBC concert focusing on music from New Zealand. The virtuoso euphonium player, Buzz Newton, will be premiering Anthony's new concerto in Wellington (St Andrews-on-the-Terrace) on May 9, with the Wellington Brass Band. Buzz released his debut solo album late last year, which featured a superb recording of Anthony's Triptych for euphonium and piano (published in score form by Prima Vista Musikk). Now he trumps that with a concerto specially written for his skills. The concerto also appears in a version for euphonium and wind band, which will be performed by the Royal Airforce Band in June. Composed with support from Creative NZ. Anthony has collaborated again with poet Elena Poletti to produce Lullabies for soprano, choir, childrens chorus and organ, a commissioned work for the Auckland Choral Society. It is being premiered in Holy Trinity Cathedral on June 6, under the baton of Brian Law. This work celebrates different aspects of songs associated with sleep, and encapsulates a child-like perspective. Composed with support from Creative NZ. Anthony's orchestral suite Portrait of FH is being performed again by the Southern Sinfonia, this time at the Festival of Colour in Wanaka, on Sunday April 26, at 1pm at the Lake Wanaka Centre. The work is about the life and work of the famous NZ artist Frances Hodgkins, and features a narrated monologue by Catherine Chidgey, interspersed with the music. The text is derived from letters home by Hodgkins while overseas. The three main movements of music depict the different media the artist used: water colours, oils, and gouache. The latter movement, gouache, was recorded for SOUNZ online by the NZSO. Anthony's fourth symphony 'Stations' has been reviewed by Music Web International. Read the full review. "The structure of the work is hugely impressive - the listener is drawn forward inexorably with each station clearly defined yet clearly part of a greater scheme. As a continuous movement lasting over forty minutes this is a compositional tour de force yet it is the deeply personal and human aspect that resonates most. Ritchie's greatest single triumph is to be both deeply personal in his reaction to his home city's tragic losses yet strikingly universal. This is not a work 'only' about Christchurch or Ritchie or indeed the Summers sculptures. Perhaps even more importantly, although the iconography is explicitly Christian this is not a specifically religious - let alone Christian - work. The message is one of suffering, transcendence and ultimately a fragile sense of hope." "I have not been as impressed by a contemporary piece of music since I heard Tommie Haglund's magnificent Hymns to the Night. Although of very different musical styles both works show that contemporary music can still speak in an intensely personal and deeply moving way. The fact that the source of Ritchie's inspiration lies entombed in the ruined cathedral and might well never be recovered - the current thinking is to demolish the existing ruins and rebuild a completely new church in its place - adds power and poignancy. That aside this is a work for all times and all people. Ritchie's music speaks with a very individual yet accessible voice and his work - and certainly this symphony - deserves a wide audience." Anthony's CD 'A Bugle Will Do' has been named "the top New Zealand composition CD of the year" by The Listener (December 12-21). Reviewer Ian Dando cites the works Revelations and Symphony No.3 as the "stunners" on the CD. The disk has also been named one of the "CDs of the year" by British reviewer Nick Barnard, on the Music Web International site. 2015 has begun with the publication of an article on Anthony's music in Edin, a new online magazine. Titled 'Anthony Ritchie - Music of the Soul', it gives some background to Anthony's reasons and goals for composing. It shows him in the coastal environment of Purakaunui, where his holiday home is. Follow this link, and go to page 10. On September 14 Anthony's new choral work Salaam was premiered by Belgium choir Aquarius, in Gravensteen Castle in Ghent, conducted by Marc Michael De Smet. It was part of a concert on the theme of imprisonment, focusing on the detainment centre at Guantanamo Bay, where prisoners have been kept incarcerated for years without trial. Salaam sets four texts written by the prisoners, published in the book Poems from Guantanamo: The Detainees Speak. They are a heart-felt plea for justice. You can now watch this performance on YouTube. Salaam begins at 51:00 on the recording and lasts 20 minutes. You can also see his Widow's Songs being performed in the same concert, at 23:00. Sharing the same concert was English composer Ed Hughs, whose work A Buried Flame is featured at the start of the programme, and also sets poems by the Guantanamo prisoners. "The passion and intrigue of New Zealand's early European history is revisited in all its drama, joy and tragedy in Anthony Ritchie and Michelanne Forster's new opera, This Other Eden." "In the world premiere performance of this stunning work, presented by Opera Otago last night [October 10] at Dunedin's Mayfair Theatre, a superb team bring to life pivotal historical figures and some of the earliest encounters between Maori and European." Anthony's piano quartet Oppositions is being performed by the Eggner Trio and Amihai Grosz during their Chamber Music NZ tour in September. This work was most recently played by Stroma and was previously recorded by The NZ Piano Quartet on a Kiwi Pacific CD of Anthony's chamber music. Click here for details of performance dates and venues. Auckland pianist Stephen de Pledge has been performing a new work for piano by Anthony, entitled Touched, as part of a Chamber Music NZ tour. Stephen visits Dunedin on September 24 to play the piece, and record it. It is a piece based on the theme of love. Anthony's new opera 'This Other Eden' is to be staged by Opera Otago in Arts Festival Dunedin, October 10-16 this year. The opera is based around a classic NZ story set in the 1820s in the Bay of Islands, featuring the missionaries Thomas and Jane Kendall, and their dealings with the Nga Puhi chief Hongi Hika. It's a story of ambition, lust and power, to a powerful script by Michelanne Forster. The production will feature a number of Music Department students and staff, the orchestra will be led by Violin lecturer Tessa Petersen, and the musical director is alumnus Tecwyn Evans. If you would like to contribute towards this production visit the website Boosted. "Ritchie's Violin Concerto is a landmark work. Hristova's performance was awesome. . . Ritchie has created an overwhelmingly personal statement of creative maturity. There is much there to reward many repeat live performances." The film and recording of Anthony Ritchie's Violin Concerto has just been released on the SOUNZ website. Anthony's Violin Concerto was premiered on Saturday May 31 by Bella Hristova and the Southern Sinfonia, under conductor Tecwyn Evans. The Dunedin Town Hall was well attended and witnessed a superb performance from the young U.S. based violinist, who seemed completely at home with the music. Her cadenzas were particularly stunning in quality, and was very well supported by a well-drilled Sinfonia. The composer was hugely appreciative of the support he received for the work; it has proved to be one of the highlights of his career so far. If you enjoy this work consider programming it in future. Bella would love to play it again: "I was honored to premiere your concerto - thank you for writing it for me! I really can't wait for the next time I get to play it and I will definitely spread the word in the US as much as I can and post the video so other people will play it, too." Click here for the full reviews. A big thanks to Radio NZ and Chris Watson (SOUNZ, NZ on Air) for their work and support on this film and recording project. Anthony's A Bugle Will Do for orchestra is being recorded by the BBC Symphony Orchestra, conducted by Pascal Rophe, for BBC 3. The recording takes place June 23, and will be broadcast in 2015-16, as part of a focus on music from the Southern Hemisphere. The Belgium choir Aquarius is premiering a new 20-minute work by Anthony entitled Salaam on September 14, in Ghent, on 'Open Monuments day'. In the same concert they will be singing Anthony's Widow's Songs along with British composer Ed Hugh's A Buried Flame in a Burning Heart. The theme of the concert is 'Songs of Imprisonment.' Anthony will be traveling to Belgium for the occasion. "Ritchie's unflinching dissonances in the codettas and the unself-conscious abrasiveness in the entire work add assured forcefulness to hi s style. Such new- won expressive range unequivocally betokens the omnipresence of truth - that prime ingredient of any artistic magnum opus, which this work certainly is... The evening belonged to Ritchie's symphonically unconventional masterpiece." "I found it a most moving work, its expressive climax being Station 12, with its references to the opening chorus of Bach's St John Passion. The intensity of Ritchie's own feeling on the destruction of his own town is unmistakable. But its strength goes well beyond the circumstance, and needs no programme to reveal its power in pure music." The symphony is based around the 14 stations of the cross, as portrayed in Llew Summers' wonderful sculptures that are now trapped in the ruined Catholic Cathedral, in Christchurch. It also uses poems by Bernadette hall that are paired with the sculptures in the book, The Way of the Cross, published in 2005 to celebrate the centenary of the cathedral. In the symphony, the suffering of Jesus Christ is made analogous to the suffering of Christchurch during the recent earthquakes. The symphony was recorded for CD by Atoll Records, and will be released later in 2014. The Centre for NZ Music also filmed the premiere, and this will be made available on their website later in the year. Watch for news of these recordings. "He strikes me as part of a small elite group of composers who have found - in their differing ways - a personal musical language that takes elements of contemporary musical culture, whether nominally classical, ethnic or popular and fuses the resulting conflation into works that speak with a relevance and depth to audiences who might otherwise feel the contemporary music genre was too unapproachable." "What is not in any doubt is just how engaging and of real worth Ritchie's music is. Certainly it deserves to be far more widely known than it currently is outside of his native country. By now it should be clear that this is music that appeals to both the head and the heart and speaks using a voice that will touch those who do not normally respond to the traditional Classical Music idiom." In November last year Anthony acted as Composer Mentor for the Todd Young Composers Competition, featuring student works performed by the NZSO. Anthony enjoyed working with these talented young composers, and also with conductor Tecwyn Evans. RNZ has made 2 radio programmes on the event, which are being aired on Sundays, April 14 and 21, at 8pm. Anthony has also devised his own radio programme, featuring Dunedin composers who are associated with the University of Otago. This is being aired on Otago Access Radio (105.4 FM) on Wednesday nights at 8.30pm, and features student composers Corwin Newall, Chris Geddes, Kerian Varaine and staff composers John Drummond, Lou Kewene, Graeme Downes, as well as Anthony himself. The remaining composer is this year's Mozart Fellow, Samuel Holloway. Listen in, or catch the podcast from the Otago Access Radio website. Anthony Ritchie's latest CD A Bugle Will Do has been selected for finals of the NZ Music Awards. Released earlier this year by Atoll Records, the CD features the New Zealand Symphony Orchestra under conductor Tecwyn Evans playing Anthony's Symphony No.3 and three other compositions. Symphony No.3 has already received The Listener's Supreme Achievement Award for the best new classical piece in 2010. Critic Marion Poole wrote that the symphony was "...compelling, rhythmically dynamic and unashamedly honest". The title track for the CD, A Bugle Will Do, is an overture dedicated to war hero Sir Charles Upham, depicting scenes from his life. If there is a theme to the CD it is the theme of conflict and peace, whether physical or mental. The third track is Revelations, describing a near-death experience and the idea of life after death. The final track, French Overture, was composed in Paris and is a Kiwi's response to life in a big city with a long history. Anthony's music is communicative, exciting and emotional and beautifully interpreted by New Zealand's world-class orchestra along with rising international star, Tecwyn Evans. The quality of the Atoll recording, produced in the Wellington Town Hall, is superb. The CD A Bugle Will Do is a must-buy for followers of classical music. You can purchase it online from www.atollcd.com or from www.anthonyritchie.co.nz. The NZSO are also selling the CD through their online shop, and it is available from retail outlets Marbecks, Parsons etc.